Transmode is a global provider of packet-optical networking solutions, working with enabling fixed line and mobile network operators supporting the rapid growth in video and data traffic. Their solutions are important building blocks in next-generation, high-speed optical networks. Since 2000, the company has installed more than 50,000 systems for over 650 fixed and mobile network operators, service providers, large enterprises and public institutions in over 50 countries across the globe. The company is headquartered in Stockholm, Sweden and is listed on the NASDAQ OMX Stockholm Exchange (TRMO). 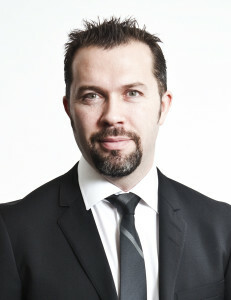 In 2011, Transmode opened their Americas office in Dallas where Björn Andersson is the Regional Vice President. SACC-Texas managed to get an interview with the Västerbotten-born Björn who moved to Dallas almost two years ago with his family to take up this new role with the company. Transmode coworkers setting up the equipment at the Americas office in Dallas. • Why did Transmode decide to establish in the USA, and why Dallas? North America is the biggest market for the type of solutions that we provide. Our biggest sales are currently in Europe, but it is here that we are growing the most. We already had people working for us in Dallas and it is a great hub for both North and South America. Dallas is a telecom nest, easy to recruit and close to both suppliers and end customers. A very significant factor in making the decision to move to Dallas, was how this would work for me and my family. Dallas was not a clear choice for us from the beginning, but we realized pretty quickly that Dallas has so much more than you can see on the surface. People are very friendly and open here. I have a hard time to see that you can end up in a better place than Texas when you first move to the USA. It’s easy to make new friends, going out to eat is affordable and everything is so available. • What is the biggest lesson from Transmode establishing an office here in Dallas? It is really important that you have the right team with a good mix of competencies. We realized that we needed to bring someone to the office that can both communicate with Sweden and the US, understanding both cultures. You have to build the major base with local Americans understanding the market but also add some Swedes in order to maintain connection to HQ and to maintain the company culture. • Do you have any advice to give to Swedish companies who are thinking about establishing a presence in Texas? They should focus a lot on the recruitment process in the beginning, it is critical and don’t let go of this responsibility until you see that it is really working. Recruiting the right people is really important, so you need to take extra care and precautions during this process. And don’t be afraid to act quickly when people are not performing. • What are the challenges for Transmode in 2015? Keep focused on the main task. We are growing rapidly and then it is easy to lose focus and risk not giving the customers the time and support they expect. When managing our growth, this is the biggest challenge that we have. Then of course our next challenge for the Americas team is to turn this region into the biggest region for Transmode. We have a big focus on this market and we have a responsibility and expectations from our owners to continue to grow with profit. • How would you say that the business climate differs between Sweden and the US? When the customer service in Sweden is closing for the day, Dallas takes over. It’s often said that the working climate here is tougher than in Sweden, but I would say that for our company selling worldwide it is more or less the same. The biggest difference is that US companies are more open to listen to new opportunities. You almost always get a chance to meet up and then it is up to you to perform. Of course this puts some pressure on us to have a professional approach that fits the local market conditions. Our competitors are mostly American companies and we have to act and look like the global company that we are. Here it is more important what you have to offer and how you can back that up rather than that we are a Swedish company. Another thing is that the sales style here is different and you can’t be too sentimental. This is why we have put such a great effort into creating the right team. We have wanted the keep the company culture from Sweden but customize it into the American one. • On a personal level, do you have any advice to give to those who are about to, or thinking about moving to Texas? Always keep the respect. If you come to a new country always respect the country’s culture. Be humble and be open to other people’s ideas and ways of looking at things. You are the guest and you need to treat your hosts with respect. • Recently you decided to join SACC-Texas as Business Member. What made you take the step? For us the network was important. Earlier this year I went to an event organized by the Chamber and I realized how many different Swedish companies there are in the region. It was a bit of an eye opener for me. Through SACC, we have had the possibility to make connections with companies in more or less the same situation as we are in. • Finally, what would you say is the best with Dallas? The best is definitely the people, the availability of all the activities and their attention to service. The worst is the lack of pretty views, mountains and valleys. The landscape is monotonous here. But there really isn’t that much negative things with Dallas, we like it a lot here. A lot more then we imagined that we would.